This is an overview of the system I use to Develop New Cultivars. The basics outlined can be adopted in the smallest of home gardens. You will be surprised at the results you will get. 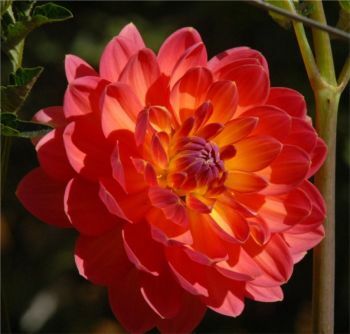 First we need to get some Dahlia Seed. 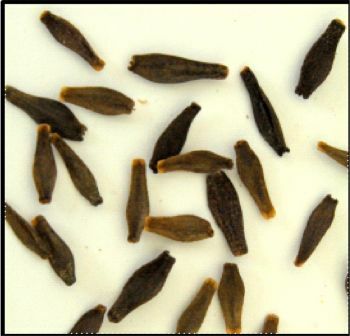 What does the Seed look like? 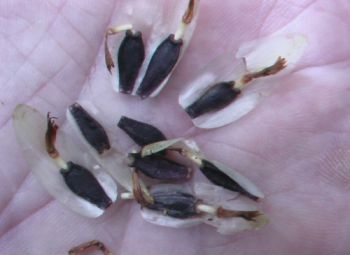 Take the mature pod and break it up and store in a dry place and sown in early Spring. Treat like germinating Vegetable Seed – Tomatoes, Cucumber & Beans etc. 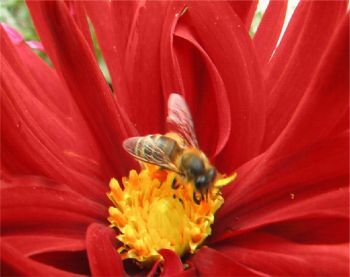 Using bees to pollinate dahlias can be a very reliable & consistent method of pollination if the following basic principles are adopted. I prefer to use bees rather than the Camel Haired Brush method because the bees are very knowledgeable individuals, and why not take advantage of it. 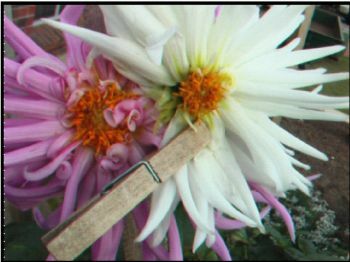 This method is well suited for those of us who are employed and do not have the time to hand pollinate. The secret to the system is that your Planting Plan is your Breeding Plan so a lot of thought has to be put into the planning of one’s Patch or Plot. And You Are Likely To Get a Type You Will Like. 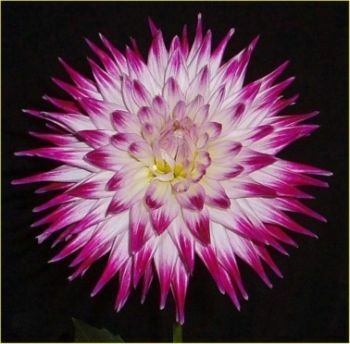 That is Waterlily to Waterlily – Cactus to Cactus - Decorative to Decorative. Mixing Types only produces Weird Types. 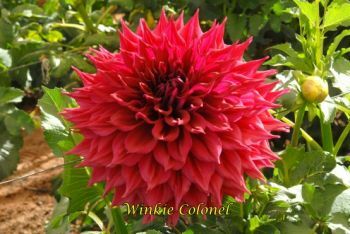 This system is not just for the large grower because these principles can be applied to the smallest of gardens, even with Dahlias grown in Pots. Firstly, Set your goal and then go for it. The use of camel hair brushes or similar does take a lot of time and the individual must have to be extremely knowledgeable for one to gain any success, not to mention the time one has to put into the process. 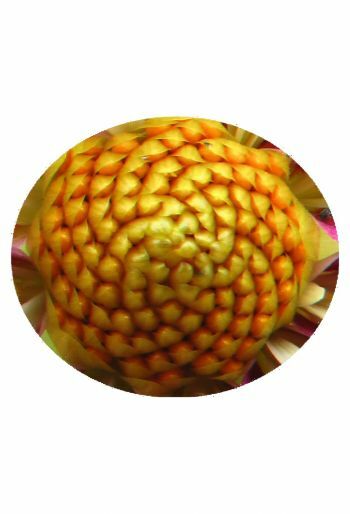 When is the pollen parent mature? 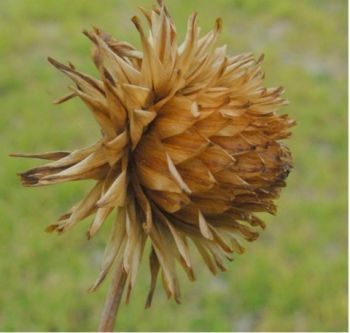 When is the pollen mature? What temperature is the introduction of pollen successful? 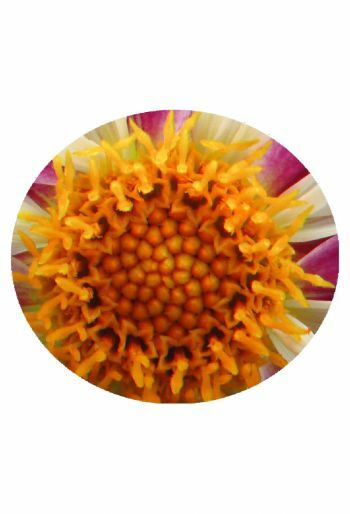 What is the ideal humidity for pollination to take place? What is the best time of the season to perform the process? Yes it sounds like one has to have a degree in biology, wear a white coat and conduct everything under sterile conditions. I do not have to know much because the Bees know it all and more, so why do I have to bother. When the pollen is mature. When the temperature is just right. When the humidity is right. 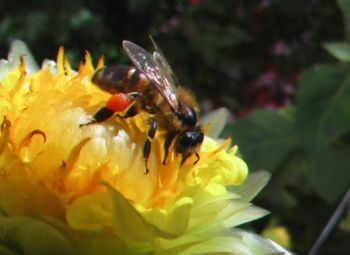 The bee also knows how to apply the pollen onto the correct parts of the flower. Plus they come in armies of thousands. All I have to do is to provide the bee with the right blooms in the right places and in the right order and the Bees do the rest. One must understand that not all the pollen is ripe at the same time. This is why the hand pollinators have to visit the bloom several times per day. The advantage of leaving this to the bees is that they can continue to pollinate all day long. My planting plan is my breeding plan. I am very aware of the desirable characteristics of cultivars which determine the placement of the POTENIAL parents planted in the patch. One MUST take into account that Virus can be transferred by seed, do not take seed from virus affected plants. I plant in rows and I always have the desired cultivars planted adjacent. This is best achieved by having at least two rows. Similar to growing Sweet Corn which is successfully grown. When the desired results are achieved the recipe can be repeated by repeating the planting the following seasons. The other good thing is that seed can be collected from both cultivars. 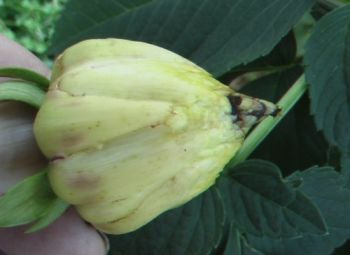 In the case of hand pollinating one cultivar is sacrificed for use as the pollen parent. I am very critical of replicating the bad habits of cultivars such as, poor keeping qualities, lack of vigour, poor stems and most important poor form. At all times I like to see like forms/styles be crossed with common like forms/styles with the aim of improving on what is presently grown. 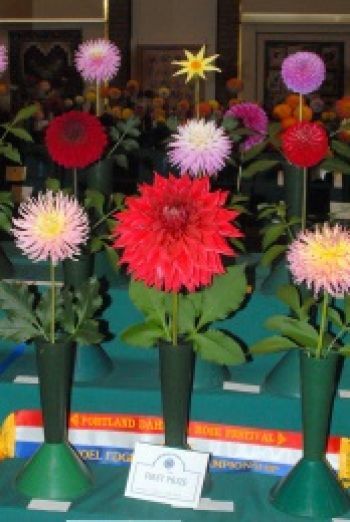 Only cultivars that are disease resistant along with good keeping qualities, good stems and good forms should be selected or considered to be parents. One is encouraged to ask questions of the breeders who appear to be producing quality cultivars. 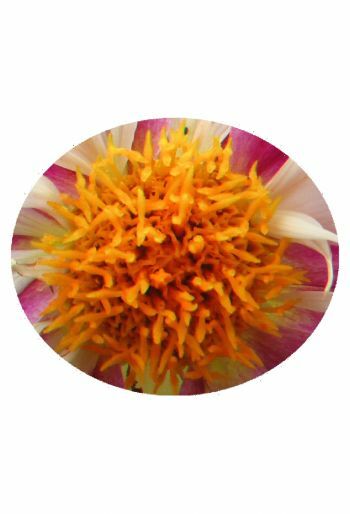 Visit their gardens where possible, observe what they are doing and then ask more questions. They are easily contacted, especially with our electronic communication. 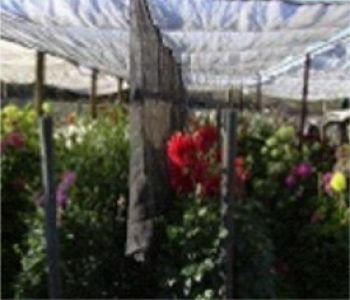 My patch is covered by shade cloth and I can isolate one type from the next by hanging a curtain (Bird Netting) which channels the bees along selected rows resulting in the desired cultivars being pollinated without the risk of contamination from other types. This principle can be applied to a small patch in the home garden without a cover by putting up a curtain between types to channel the bees. This curtain (Barrier) only has to be about four feet higher than the plants. 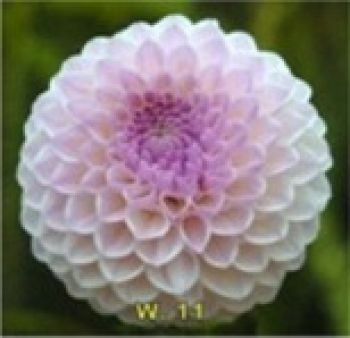 The Bee Lanes restrict the Bees to one type of Cactus, Decorative, Pompon, & Waterlily. If area permits isolated planting is a good reliable way to go. 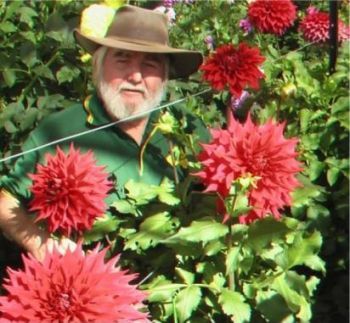 Isolated plantings work well for Dr. Keith Hammett (NZ) and Steve Boley (Birch Bay Dahlias – Washington State) and it also worked for the late Gordon Leroux (Kenora Dahlias USA). "Gordie" had special signs up for his bees showing them where to go. 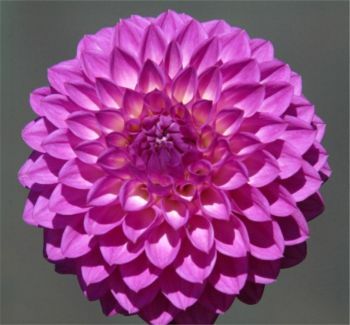 There is a lot to be said for isolated plantings a good distance away because it reduces any other dahlia influence. These combinations can be repeated time and time again especially if one can raise a couple of good ones. can be completed in the back yard without too much trouble. If they do not work you at least have some good extra stock of that cultivar. 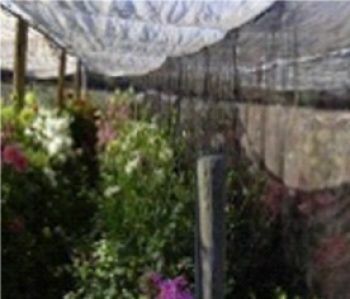 The mobiles can also be introduced into the main plantings at the right time making this method very flexible, especially for the small grower. 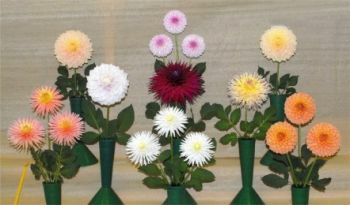 Vases of a desired cultivar can be placed in plants which can also produce good results. Let’s remember that “ALL CULTIVARS” were once a seed.